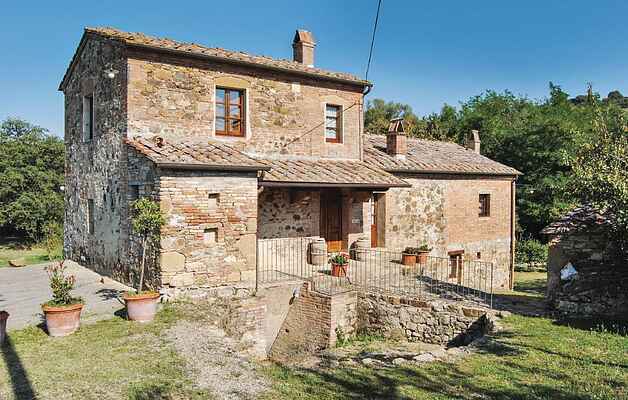 This charming holiday home, a former medieval mill spread out over three levels, is set in an idyllic valley only 3 km from Montepulciano. From the combined kitchen with living room and the room with fireplace on the ground floor you have access to an equipped outdoor area. On the 1st floor, which is accessed from one side of this former mill, there are a second central kitchen and bedrooms with bathroom, a second bedroom with bath is on the 2nd floor. The decor is functional and in rustic Tuscan style. Baby bed available on request. The house is adjacent to ITS971. Nearby places to visit are: Pienza (15 km) and the picturesque Orcia Valley, the warm thermal baths of Bagno Vignoni (25 km). In the small medieval hill town of Montepulciano you will find trattorias, bars and shops of all kinds. Unpaved access road.